You can either use fresh or canned pumpkin. To use fresh, simply roast or boil the fresh pumpkin before you puree it. You’ll need about 1 ¾ cups of fresh, pureed pumpkin for this recipe. If using canned pumpkin, choose the plain pumpkin as opposed to the pumpkin pie filling, which already has sugar and spices mixed in. If you need to use the pumpkin pie filling, omit the sugar and pumpkin pie spice. If you don’t have pumpkin pie spice on hand, you can substitute it with ½ teaspoon ground cinnamon and ¼ teaspoon ground nutmeg. To make the mousse, first place an empty medium sized bowl in the refrigerator to chill. Then in a medium saucepan, add the pureed pumpkin, 1 cup of the cream, sugar, and pumpkin spice. Set the heat on medium and cook for 5 minutes. Turn off the heat and let cool completely. You can put it in the refrigerator to speed the cooling process along. Add remaining 2 cups of cream to the bowl that’s been chilling in the fridge and whip until soft peaks form. Gently fold in the pumpkin mixture using a sturdy rubber spatula. Pour mixture into serving dishes and serve with gingersnaps, if desired. Sprinkle with cinnamon, nutmeg, or pumpkin pie spice, if desired. Pumpkin Mousse Pie. Double the recipe listed above. Pour mousse into a pie pan that has been lined with gingersnaps. You can also use a simple graham cracker crust and top the mousse with crumbled gingersnaps. Pumpkin Mousse Cake. Prepare cake recipe of choice and bake in two 8 inch round pans. Let cake cool completely. Spread ½ of the mousse on top of one of the cake rounds. Top with the second cake, and then remaining mousse. Spread some of the mousse over the sides, if desired. Pumpkin Trifle Recipe. Double the pumpkin mousse recipe listed above. Make any trifle of your choice, but substitute the pumpkin mousse for the pudding. Pumpkin Mousse Cheesecake. 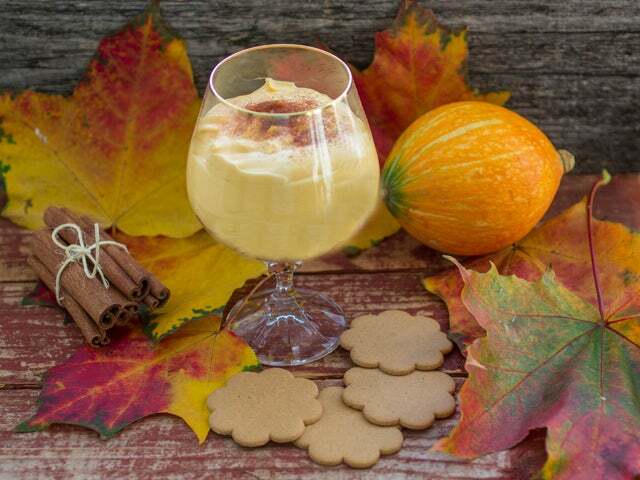 Prepare the pumpkin mousse recipe listed above. Make your favorite cheesecake. Top cheesecake with the prepared mousse using a standard pastry bag fitted with a size 10 tip. If you don’t have a pastry bag, you can simply spoon it over using a large tablespoon. Frozen Pumpkin Mousse. To make a frozen treat similar to ice cream, prepare the mousse as directed. Place in a plastic food-storage bag designed for the freezer and seal it well. Freeze overnight, or until the mixture is frozen all the way through. Remove from bag and pulse in a food processor until creamy. Serve immediately. If creating your own dessert on this special day isn’t in the cards, you could always have one of our great pumpkin flavored desserts delivered! My favorite, is the Pumpkin Cheesecake!